It is easy to see how Strobilanthes was dubbed the Persian shield. The shape of the leaves appears like little armor shields fitting for battle. 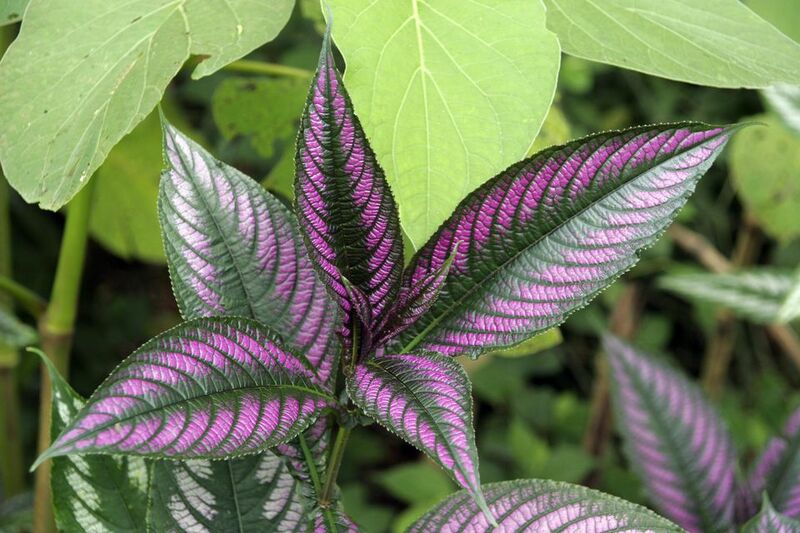 Its 6-inch flashy leaves have a purplish iridescence that gives them an almost silvery metallic look. Although its name is called "Persian," it is native to Myanmar (formerly Burma) not Persia. It is a sub-shrub that is evergreen in hot climates. In cooler climates, it is grown as an annual and is even more popular as a houseplant, because it tends to bloom during winter. It can grow well in containers or outdoor flowerbeds. If Persian shield plants bloom, it is usually in fall or winter. When grown as an annual, Persian shield may not have enough time to set buds and flower, but you will not miss them with all those colorful foliage. Plants grown indoors will generally bloom in the winter, but you may prefer to pinch them off and develop a fuller plant instead. The flowers tend to be small and are out shown by the leaves. Persian Shield prefers moist soil and some shade during the hottest parts of the summer. Persian shield planted in partial shade will pick up the light and reflect it back off its leaves. If kept indoors, Persian Shield needs bright light to keep its color and temperatures above 60 F.
Persian shield grows well in the neutral range of soil pH and can tolerate slightly acidic soil. Keep the pH between 5.5 and 7.5. The less water the Persian shield plant gets, the more shade it will need. Cold water may spot the leaves, so if you see spots the day after a rain, it was probably the cold water and not a disease. Growing Persian shield requires warm temperatures and sultry humid air. It is hardy in USDA hardiness zones 9 to 11 but is more commonly grown indoors or as a summer annual in cooler climates. In zone 9, and in during mild winters in zone 7 and 8, Persian Shield may die back to the ground after frost but remain alive and regrow the following season. In Zones 10 and 11, it should remain evergreen or "everpurple." If growing indoors, make sure it has humid conditions. Dry air will cause the leaves to dry and drop. Misting daily is recommended, but be sure to use soft water. Chlorine will damage the leaves. If grown in rich soil with plenty of moisture, Persian shield should only need light feeding at the start of the season and again about midway through the summer. You can start Persian shield from seed or cuttings. Seeds require somewhat warm conditions (55 to 64 degrees F) to germinate. Plants can easily be started by softwood cuttings. Applying some bottom heat will keep them from rotting before they establish roots. Spring and early summer are the best times to take cuttings. When indoors in a container, the idea is to keep the plant to a manageable size instead of letting it grow to its full capacity. the best way to accomplish this is to repot younger plants annually until they reach their maximum size, then repot every other year. Root prune older plants as a way to control their size. If your plant becomes leggy, take stem cuttings and discard the mother plant. Since Persian Shield is grown for its foliage and the flowers are not particularly showy, many gardeners like to pinch back the leaves, to create a fuller plant. If left to grow on its own, it can get tall, leggy and floppy. Do not remove the fading leaves that develop immediately after flowering. The leaves may look sad at this point, but that is because the plant has gone dormant for the remainder of the winter. Resist the temptation to pinch at this point, to avoid disturbing dormancy. Resume pinching when the plant starts growing in earnest in the spring. It makes a striking border plant, particularly when paired with soft gray greens or chartreuse. In USDA Zone 10 and higher, Persian shield can get quite bushy and makes a wonderful focal point. It may even overwinter some years in cooler climates. Even when grown as an annual, Strobilanthes make an eye-catching addition to borders and containers. Bring a plant or two indoors, and grow as houseplants through the winter. You can always move them back outdoors in the spring. Aphids and whiteflies can become pests, especially when the plants are drought stressed. Persian shield is not usually susceptible to fungus disease or other problems with the foliage, except water stress and spotting.